In 1983, Dunmurry Golf Club moved from its original location north of Dunmurry village. In 1983, Dunmurry Golf Club moved from its original location north of Dunmurry village to a site overlooking the River Lagan and adjacent to Sir Thomas and Lady Dixon Park. With views up the Lagan valley to the south and north towards the Belfast hills, the course merges into the woodlands comprising the Lagan Valley Regional Park. 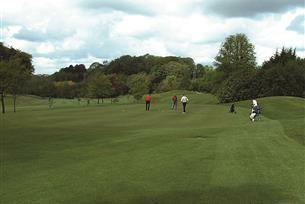 Dunmurry has matured quickly and now provides some of the best playing conditions in the Belfast area. The 18 holes offer a variety of challenges, none more so than the par 5 fourth, requiring three accurate shots to reach an elevated, doubletiered green, the approach to which is well protected by mature trees.